Groups in Tithe.ly ChMS can be set to appear in the Member area. This is determined by the Group Category they are part of. 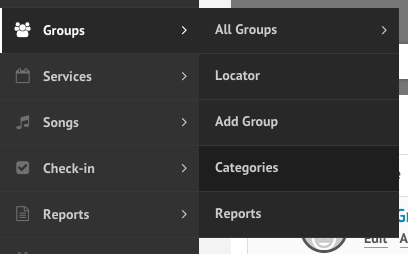 To enable specific categories to appear in the member area first go to Groups > Categories. Once you’ve selected this you’ll need to select if you want existing members to appear in the list of members for other members by default or not and which fields to display. If you don’t select this option individual members will need to set themselves to appear. This option only appears while you’re enabling the category to appear. Once it’s enabled the setting will no longer appear, and members will have to choose to display themselves to other members.